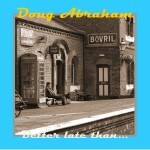 Share the post "Album review: DOUG ABRAHAM – Better Late Than…"
Doug Abraham is a fine Liverpudlian singer-songwriter and confident guitarist who has a solid background in instrumental music and funk rock, though this album goes well beyond those genres. The title of the album ‘Better Late Than…’ presumably refers to a debilitating hand condition that took three years out of his life. Happily he managed to channel his off-the-road energies into thoughtful songs, and armed with the advice of the legendary lyricist and producer Pete Brown he has settled on 11 songs that make up a coherent album. ‘Better Late Than…’ is full of impressive narratives, wholesome melodies and expressive solos that are topped by his wiry vocal that evokes Elvis Costello, Graham Parker and even Bob Dylan. His vocal is even more ragged than Dylan on the magnificent ’Meeting With The Blues’, which provides the album’s perfect book-end. It’s one of his very best songs and is up there with Tom Waits, as he imbues the number with such emotion that it rises above his own vocal limitations on a stellar example of the potency of his song craft. ‘Better Late Than…’ is full of heartfelt narratives given a passionate delivery, no more so than on the slow building ballad ‘Memory Lane’, which resolves itself with a slide opus before the gentlest of outro’s. Most of the album is characterized by Abraham’s understated style which focuses on his lyrical message. And ‘Better Late Than…’ has plenty to say, as he winds his way through eleven tracks that imperceptibly gather momentum and become a weighty composite, well beyond the usual confines of the singer songwriter template. Sometimes the songs have the feel of a work in progress, which given the benefit of being road tested could morph into something weightier. He’s joined by some impressive guests including Brit blues pianist Paddy Milner, drummer/producer Wayne Proctor and guest American bass player David Hadley Ray – one of three bass players – who all add to the album’s rich variety of grooves, dynamics and moments of real spark. Played back to back, ‘Better Late Than…’ sounds as if Doug has poured a lifetime of emotion and experiences into a set of songs that announce a new significant talent on the roots rock scene. The opening ’Amateur Detective’ is a riff driven piece, that initially owes much to Ten Year After, but opens into a big drum 80′s feel, to give the album a breezy opening that balances out his workman like vocals. ‘Don’t Get Out Much Anymore’ is full of angst and is nicely counter-weighted by the gently plucked melody of ‘On The Shelf’, on which the narrative takes precedence. In truth, Doug isn’t a great singer but he does know how to phrase and when to attack a song and tease out the meaning of a lyric through a mix of passion and anger. ‘Unfinished Business’ features Paddy Milner on a song with a piano-led lilting feel that has the kind of melodic sweep to be found at the heart of a well crafted album. ‘Someone Says’ gives him an opportunity to showcase his chops with a good use of sustain, offset by an effective chanted hook, while ‘Don’t You Tell Me’ is an object lesson in effective sequencing as the seamless rhythm section give the album a subtle lift. Abraham rocks out on the reflective ‘Blame’ which you could well become be a live favourite. As it is, he matches his lyrical angst with some fiery guitar that cuts through his restrained style and gives the song real heft. This entry was posted in ALBUM REVIEWS, ALBUM REVIEWS (Mobile), All Posts and tagged album review, Bob Dylan, David Hadley-Ray, Doug Abraham, Elvis Costello, Graham Parker, guitar, Paddy Milner, Pete Brown, singer, songwriter, Ten Years After, Tom Waits, Wayne Proctor. Bookmark the permalink.